You might be walking by the Portland Art Museum off Park Street in Portland sometime and hear piano music playing somewhere. The music might be so good (classical, jazz, blues) that you may be fooled into thinking that it is coming from a stereo or sound system but turn into the courtyard at the museum and you will see a young man or woman in street clothes playing passionately on a colorfully decorated old piano. Welcome to Portland and welcome to the work of Megan McGeorge, visionary and founder of Piano. Push. Play. Megan, a skilled pianist in her own right, was walking downtown in 2011 when she heard cello music being played by a local musician. A cellist was busking (playing for donations) on the street – the occupation of many musicians here in the Rose City. Megan considered wistfully what it would be like for a pianist to be able to give an impromptu concert right on the corner; not necessarily for donations but just for the joy of the music. Musicians with more portable instruments (like violin, cello, guitar, sax, etc.) have a distinct advantage over pianists with their ponderously heavy and difficult to transport instruments. Megan eventually pitched the idea of a street concert to Brenda Kell, the current general manager of Portland Piano Company. Brenda and PPC owner Mitch Paola were impressed with the idea and arranged to provide a piano for a single street event. Eventually, the store agreed to provide a piano with special dollies attached to facilitate Megan being able to wheel the now itinerant piano around the neighborhood. Now you get the name genesis of a piano to push and play. Eight street performances were given in 2012. The following year, Megan asked if Mitch and Brenda would be willing to donate a piano to her bourgeoning cause, which they were willing to do. Soon, Megan was finding other kind hearted people who were willing to donate their old pianos from their basements, attics and recreation rooms to the organization. Technicians like Dave Page were also willing to donate their time and skill to keep the fleet in good tuning and repair. 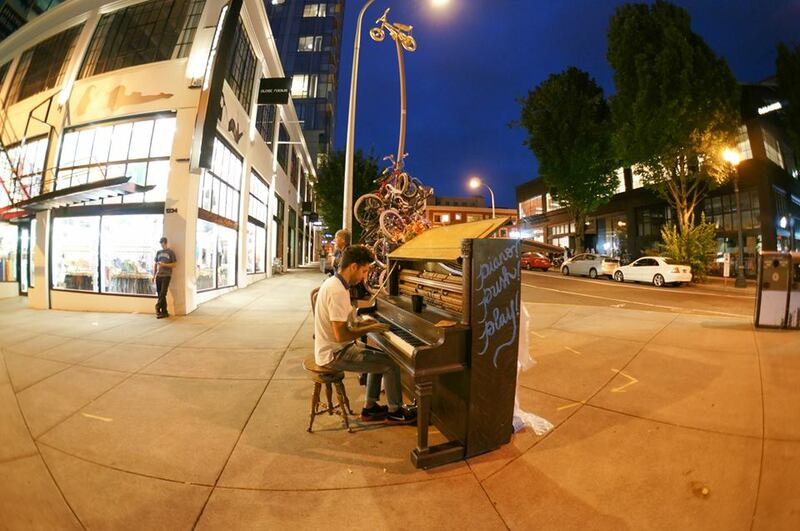 The pianos began appearing in places like the Saturday Market, Pioneer Courthouse Square, Waterfront Park and the artist co-op ADX. Some of the current supporters of the effort are the Portland Art Museum, West Coast Piano Moving and Storage, bassist extraordinaire Esperanza Spalding, Awesome Portland, Portland Piano Company and Portland Parks and Recreation. With Portland Parks’ involvement, several of our local parks now have Piano Push Play installations. Every summer new pianos appear. They have names as colorful as the decorations festooned on these reborn music making machines. The 2015 batch are named after great musical composers: Beethoven, Bach, Chopin, Bartok, Mozart, Scarlatti, etc. Local artists paint and decorate the pianos extravagantly. You can view the pictures here. The pianos are available at outside locations for anyone and everyone who wants to play. Megan says that she is surprised and impressed by the level of musicianship of many of those who choose to play. Even if you want to play Chopsticks, Heart and Soul or the infamous Fur Elise, you are more than welcome to tickle the ivories. Megan also noted that there are some very good musicians who are homeless and the Piano Push Play installations enable them to practice and perform when they would not otherwise have access to an instrument. The players, especially the skilled ones, frequently draw crowds and spontaneous sing alongs are not unknown. Gimbal and Urban Airship have even implemented high technology for PPP that reaches out and invites people to come play the pianos. At the end of the summer. all of the beautiful instruments are donated to worth permanent installations and communities centers where they can continue to be enjoyed by many. Then the process begins all over again with a new batch of veteran instruments to be overhauled, decorated, fluffed and otherwise prepared for an army of street musicians and curious tinklers. The community and especially the Portland Art Museum have really stepped up to support the effort. Megan sends special kudos out to Brenda, Mitch and Terry Robson who co-ordinates PPC piano events. Says Megan, “This would not have happened without Brenda and Portland Piano Company, Mitch and Terry. They gave us our first piano.” In reference to Megan, Adam Zucker with Awesome Portland says, “Her idea was great. It’s been one of the most successful grants that we’ve had and was really kind of a magical experience … seeing people playing the pianos around town.” Check out the Piano. Push. Play. website here. So if your smart phone reaches out to you and invites you to play a piano don’t be alarmed. In Portland our pianos are just very friendly.